View all the videos in chronological order with study guides and additional texts. 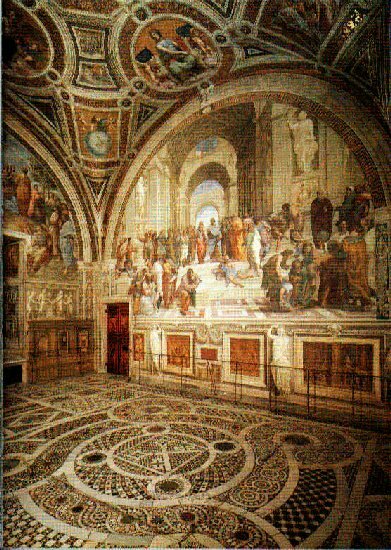 Raphael was called to Rome toward the end of 1508 by Pope Julius II at the suggestion of the architect Donato Bramante. At this time Raphael was little known in Rome, but the young man soon made a deep impression on the volatile Julius and the papal court, and his authority as a master grew day by day. 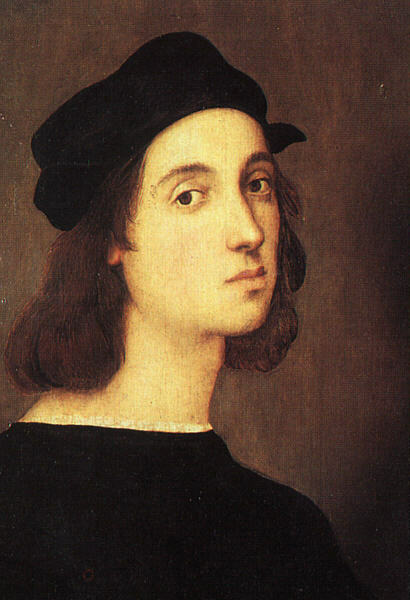 Raphael was endowed with a handsome appearance and great personal charm in addition to his prodigious artistic talents, and he eventually became so popular that he was called "the prince of painters." Raphael spent the last 12 years of his short life in Rome. They were years of feverish activity and successive masterpieces. 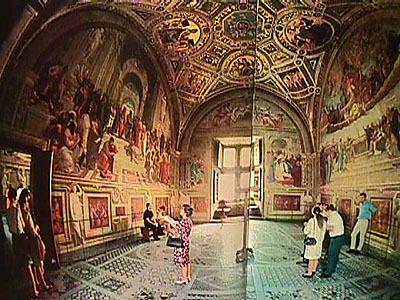 His first task in the city was to paint a cycle of frescoes in a suite of medium-sized rooms in the Vatican papal apartments in which Julius himself lived and worked; these rooms are known simply as the Stanze. The Stanza della Segnatura (1508-11) and Stanza d'Eliodoro (1512-14) were decorated practically entirely by Raphael himself; the murals in the Stanza dell'Incendio (1514-17), though designed by Raphael, were largely executed by his numerous assistants and pupils. The decoration of the Stanza della Segnatura was perhaps Raphael's greatest work. Julius II was a highly cultured man who surrounded himself with the most illustrious personalities of the Renaissance. He entrusted Bramante with the construction of a new basilica of St. Peter to replace the original 4th-century church; he called upon Michelangelo to execute his tomb and compelled him against his will to decorate the ceiling of the Sistine Chapel; and, sensing the genius of Raphael, he committed into his hands the interpretation of the philosophical scheme of the frescoes in the Stanza della Segnatura. This theme was the historical justification of the power of the Roman Catholic church through Neoplatonic philosophy. The four main fresco walls in the Stanza della Segnatura are occupied by the "Disputa" and the "School of Athens" on the larger walls and the "Parnassus" and "Cardinal Virtues" on the smaller walls. The two most important of these frescoes are the "Disputa" and the "School of Athens." The "Disputa," showing a celestial vision of God and his prophets and apostles above a gathering of representatives, past and present, of the Roman Catholic church, equates through its iconography the triumph of the church and the triumph of truth. "Last years in Rome.." Britannica 2001 Standard Edition CD-ROM. Copyright © 1994-2001 Britannica.com Inc. December 3, 2002. 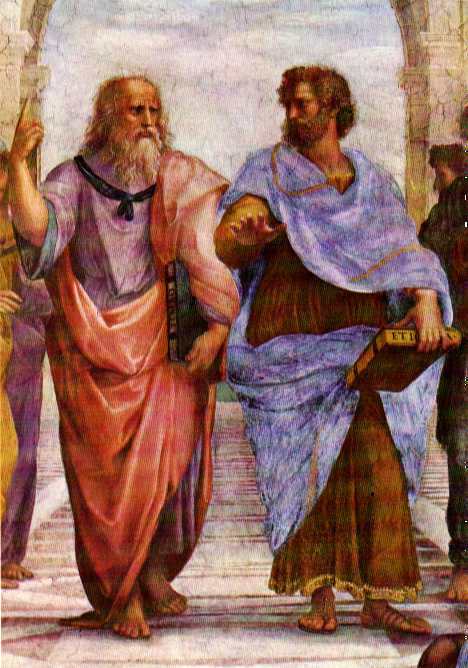 The "School of Athens" is a complex allegory of secular knowledge, or philosophy, showing Plato and Aristotle surrounded by philosophers, past and present, in a splendid architectural setting; it illustrates the historical continuity of Platonic thought. The "School of Athens" is perhaps the most famous of all Raphael's frescoes, and one of the culminating artworks of the High Renaissance. 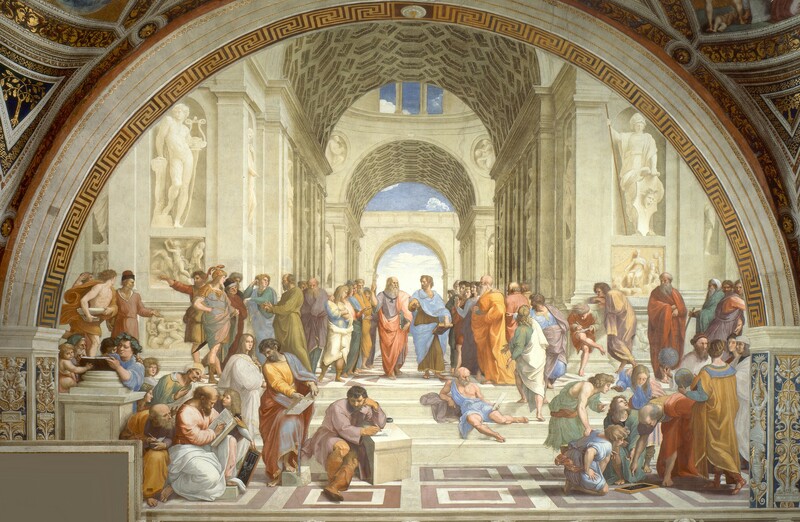 Here Raphael fills an ordered and stable space with figures in a rich variety of poses and gestures, which he controls in order to make one group of figures lead to the next in an interweaving and interlocking pattern, bringing the eye to the central figures of Plato and Aristotle at the converging point of the perspectival space. The space in which the philosophers congregate is defined by the pilasters and barrel vaults of a great basilica that is based on Bramante's design for the new St. Peter's in Rome. The general effect of the fresco is one of majestic calm, clarity, and equilibrium. "Last years in Rome.." Britannica 2001 Standard Edition CD-ROM. Copyright © 1994-2001 Britannica.com Inc. December 3, 2002. 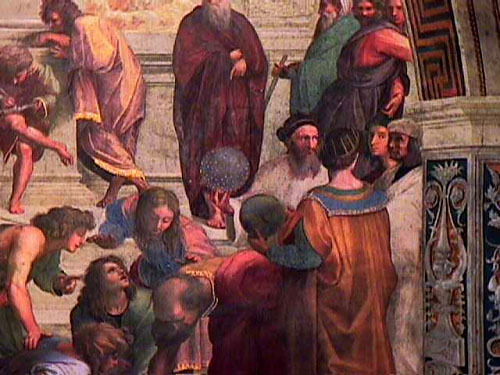 Raphael put portraits of important and influential people in the painting as a way to express the idea that the new Papal court was an updated, yet Catholic, school of Athens. 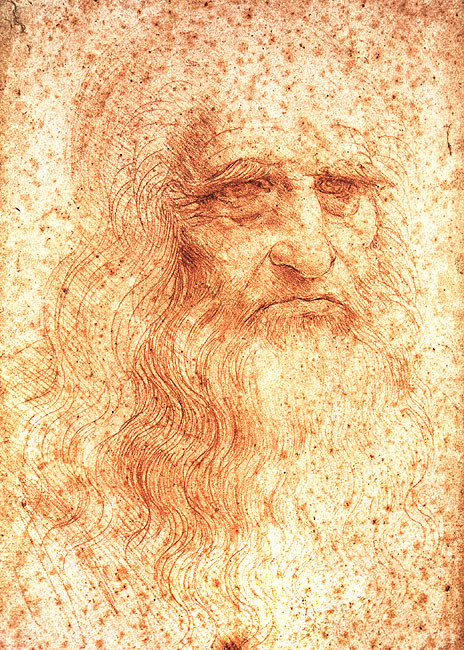 Raphael uses Leonardo's face as a model for Plato, who gestures up. 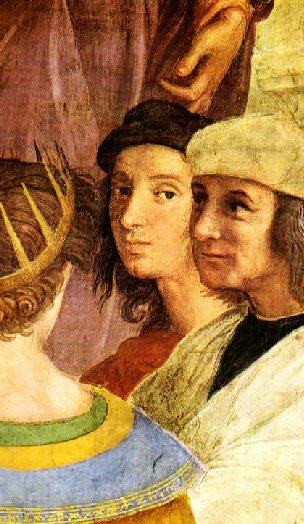 Zoroaster, Ptolemy, Raphael and Sodoma One of the skills that most painters needed to develop during the Renaissance period was the ability to paint portraits and accurate likenesses. Often this skill was developed by painting with a the only model that one might have available which is one's self. The humanistic and platonic idea of perfectibility also gave rise to self reflection and observation and in this case, self aggrandizement. A portrait then is not just about the immediate appearance but also it is a symbol of the person. In this image we see that the artist is studying himself and also demonstrating his ability to create a strong physical likeness as well a psychological likeness.